I could go two ways - either write ANOTHER post with my thoughts and what not and make it heavy duty ... or keep it simple and easy ... just like weekends are supposed to be ... I am going to choose the later! :) Also, I have to keep my promise of being light on writing this week! lady that bike necklace is to die for...quite love it!!! oooh i like this necklace! and am thinking coloured jeans 'right now'! Anyway, love the ombre effect and that bik necklace! Oh tanvi :) I <3 the necklace! very interesting combo over there. You just reminded to wear my ink blue top sometime soon. It has been sitting pretty in my wardrobe. Two Favourite Colours,on one favourite person!! !Endless possibilities....loved this!!! Happy Friday darling, you look beautiful and love the Dior Gaucho saddle bag! The blue and green look lovely together ! I am totally digging the bike necklace ! Its so cute. 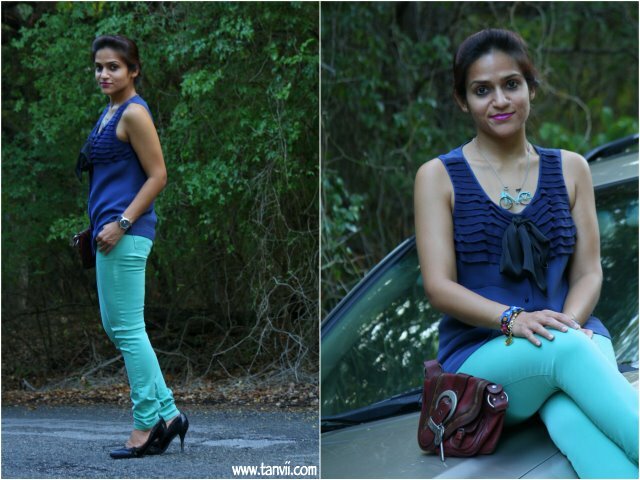 Nice blog Tanvi. Yes yes this is great color combination, and that sweet bicycle is such a perfect addition to all!!! Great bag hun, u always know what u do!! ;) Enjoy your weekend, kisses!! Your necklace is tooooo cute! The bike is beyond colour, it looks more like a pixie bike than just a pendant! 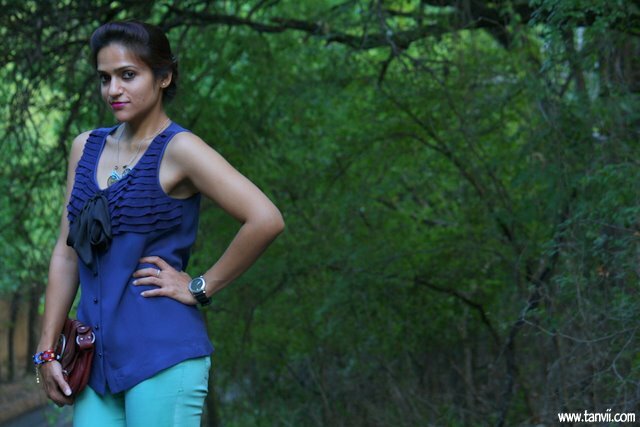 Love the blue green combo! Great look! I absolutely love that necklace. fab look..loved the necklace ! Beautiful in blue! I love that necklace, it's fabulous. I love the terrific combination of colors, the chic shoes and, of course, that marvelous bicycle necklace. Stopping by here is always the refreshment I need! Love your blue and green! Looking so pretty! definitely loving that bicycle necklace. have a great weekend Tanvi! and we'll definitely be meeting up in NYC. 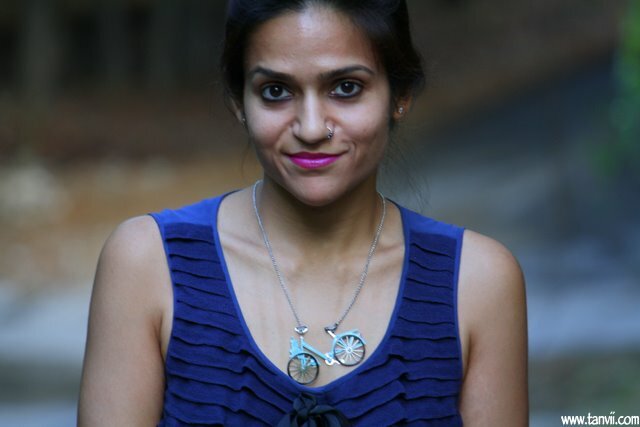 I love your necklace Tanvi! So fun and quirky! Love the blue and teal color together!! It looks amazing. have a grand weekend, my friend. Have a great weekend honey. That pendant!OMG!I just want to steal it from you and run away to Africa! Aww this is a cute post. Cute necklace, cute you. Except, the watch is fierce and I love it! Love this color combo! Those jeans rock! love the last two shots. How adorable is that necklace darling? If you ever want to travel to my corner of the world, just let me know and I'll take you out! Have a fabulous weekend dear! Love the Blue & Green!! I'm dying over the bike necklace! It's fabulous! Awwww the bicycle necklace is super cute!! I like your blue ruffled blouse as well and it looks kinda refreshing(sorry for the lack of a better word :p) with those Zara jeans.. I wish you could take a break and vacation somewhere! I know I'm SO UP for a trip to Paris right now! Or New York in 2 weeks for Fashion's Night Out, I wish I could go but I have school and it's really expensive either way :(. couldn't find the response for the above post. love the key hole on the floral blouse and what an amazing list of advice! i really like all the ones that mattered are the ones you loved. It's not easy to pull off colored jeans but you look amazing. I'm crazy for that bag. I am worried I will look like a walking blob of cotton candy in a pair of coloured jeans, but I like yours so much... I just might try it! Dior saddle bag!! major envy!! this song comes to mind: munnabhai cycle chale pam pam pam...chowpatty jayenge bhel puri khayenge..achi achi surathon se aanken milayenge..